CARtooning creating mechanical madness since 1975. George's work is known around the world from magazines, greeting cards and advertising. Do you have a thing for cars? Do you like hot rods, monster trucks or luxury sports cars? Does a full blown dragster leaping off the line in a cloud of fire and smoke give you chills? Are you a fan of hot rod art and the classic auto enthusiast's cartoon magazine CARtoons? Look no further because the Crown Prince of automotive cartooning, George Trosley's best-selling book How To Draw Cartoon Cars is now available for all your mobile devices in e-book format! 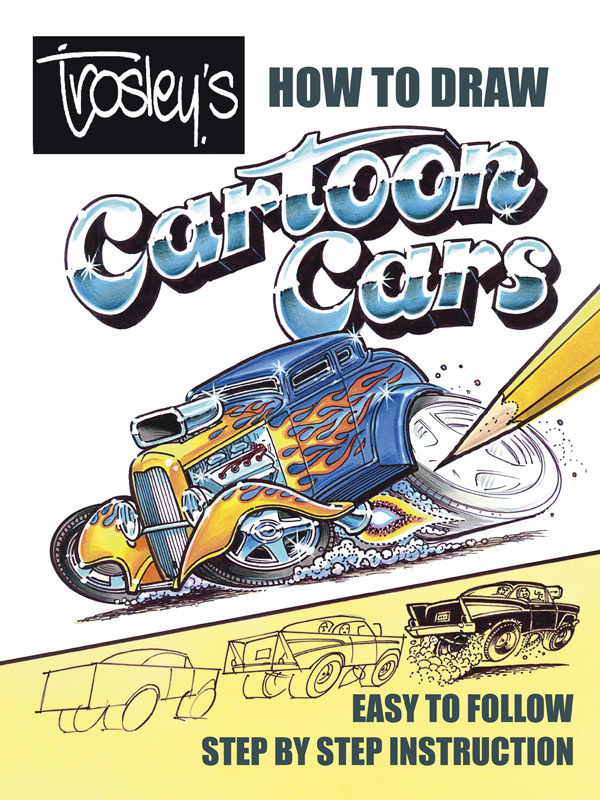 In it the legendary Troz shares his secrets for drawing the wildest hot rods, trucks, classic cars, motorcycles and more with easy step-by-step instructions! Learn to build your drawing from simple shapes, refining your sketch and adding detail until you end up with a sweet ride ready to burn rubber right off the page. In no time you'll be creating your own masterpieces of mechanical mayhem with his expert guidance and the knowledge accumulated from a 40 year career in car cartooning. Troz also shows you how to add speed and attitude to a cartoon car and includes tips on drawing engines, tires and lights, custom paint jobs, frames and body graphics. Indy cars, pro-gassers, ATVs, off roadies, Lamborghinis, custom vans, mini trucks, it's all here! So sharpen your pencils, get some paper, fasten your seat belts and floor it! This title is now sold by another publishing house. At Fun-E-Books Publishing we believe that if an author would like to switch to a publisher that will give them more opportunities in the publishing world we won't stand in the way of their dreams. George is an old, old friend (and we've known him a long time too) and so FEB let him move to a new publisher. We all have our publishing dreams and sometimes they lead in different directions. Good luck George and thanks. High resolution images. Click command (+) on your keyboard to enlarge the page enough to view comfortably.